We have a batch of skilled designers who are proficient in the design software such as UG, Pro-E, Solidworks etc.. We can exactly express the design purpose of our customer from design idea to the form of products concept, then to one time molding of metaphase construction assembly. With the advanced CAD/CAM/CAE software, we collaborate closely with our customers on all aspects of the programs so as to develop the best designed molds that are easy to maintain and plastic components that are cost-effective to produce. 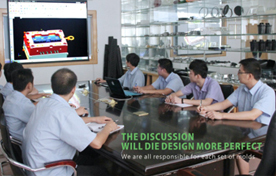 Using Pro-Engineer, Unigrahics and AutoCAD for product design and mold design. Pro-Engineer and Unigrahics possess the capability of direct part line processing from product 3D model. The assembly drawing is generated from defining parameters for standard components of mold base, insert parts, slides. The design is completed in a 3D environment and the drawings can be generated in 2D format. Our superior level of engineering expertise and CAM technology enables us to program even the most intricate cutter paths from surface geometry for molds that are production ready right from the very start. The Powermill software is extended into the CAM process. Data consistency is guaranteed by using the data from the CAD file for the CAM job of NC programming. We use a variety of Mold flow analyses early in the project cycle. Plastics Advisor provides a quick assessment of a part‘s ability to be filled based on specific material grade and gate locations. Parts with fill issues or inconclusive data output may undergo more advanced analysis that takes into account additional variables for more comprehensive results. It will offer to mold designer the best reference solution and greatly reduce the tooling and moulding development lead time.